Make your own dry erase board with a decal. The total project takes about 10 minutes, which makes this a great project for gift giving. I purchase most of my frames at garage sales, estate sales or Goodwill to keep costs down. 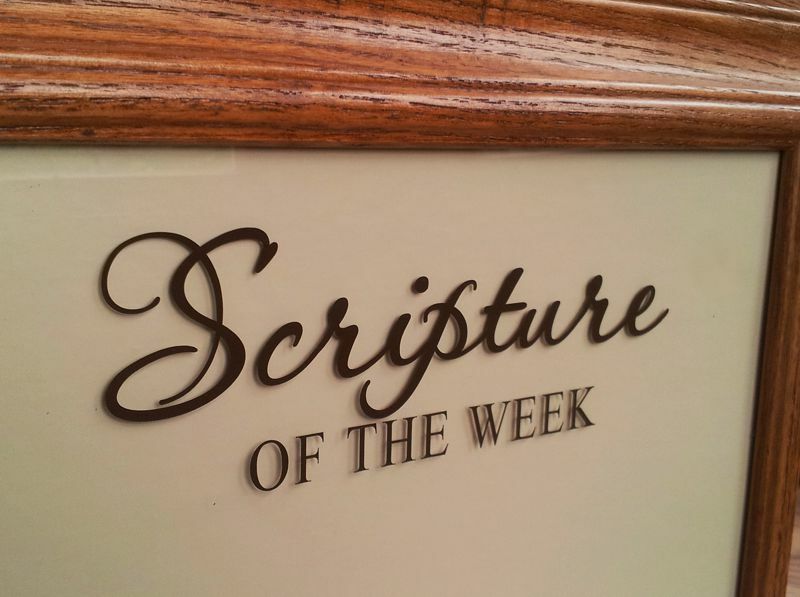 The Scripture of the Week decal is placed on the back side of the glass and the decal test is cut “backwards” or the mirror reflection. The sticky side of the decal if the top side of the text. We place the decal on the back so that the front can be cleaned unencumbered by the decal. 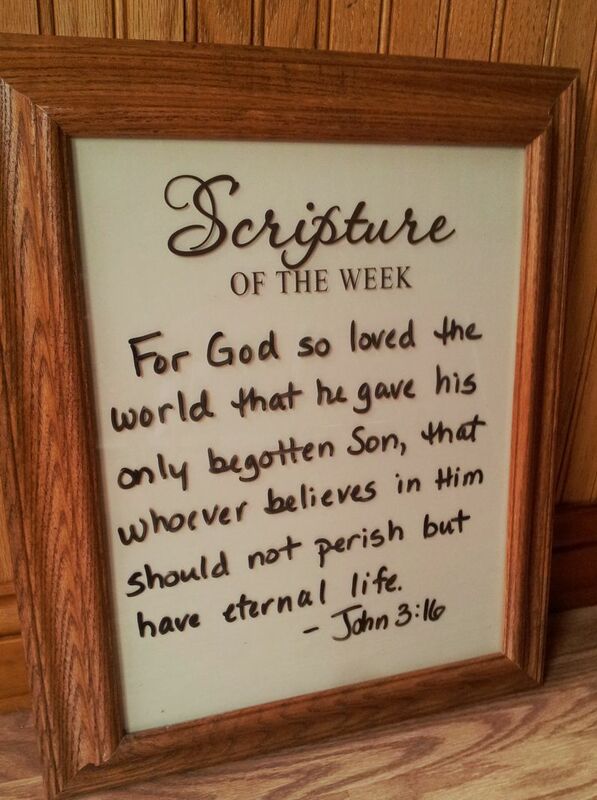 Seeing the scripture throughout the day gives me such encouragement. I keep my dry erase board in the kitchen, so each time I walk through, I see the verse and it helps to keep me focused on important truths. I’ve gotten quite a number of compliments so I made them for Christmas gifts this year and had a craft party for friends and neighbors who wanted to make them as well. Everyone loved them!! I found an old frame (for an 11″X14″ portrait) in my closet, took the glass out and cleaned both sides well with glass cleaner. I removed the backing, then applied the reverse image of Scripture of the Week decal to the back of the glass. The sticky side of the letters was on top of the letters. By applying the decal to the bottom side of the glass, you never have to worry about the decal coming off when you are cleaning the glass. That’s all there is to it! These make the most adorable gifts without breaking your wallet. You can really keep the cost down by purchasing your frames at thrift stores or garage sales. Jazz them up by upcycling the frames with spray paint. Create and have fun!!! Note: This item is also available if you prefer to paint the phrase on glass or chalk board with a Scripture of the Week stencil. This entry was posted in DIY Projects, DIY Vinyl Decal Projects, Glass Decal Application, Home, How to apply vinyl decals, How-to and tagged bible verse, Christian, decal, decals, diy dry erase board, diy project, dry erase, dry erase board, glass, photo frame, phrase, scripture, scripture of the week, scriptures, verse, vinyl decal, vinyl decal on glass. Bookmark the permalink.